Why did we do a hypnobirthing class? I had researched hypnobirthing as I previously had suffered with anxiety and honestly was scared to death about labour and giving birth, and dragged my slightly skepticism husband along to a taster session with Sandra. I thought the idea and background sounded great and quickly my husband became a fan too so we jumped onto a course which proved invaluable. The information Sandra and hypnobirthing provided not only introduced us to techniques but also gave us such a wealth of information from how your uterus responds during labor to what the midwifes do and so much more. I was fascinated at how much the hypnobirthing techniques came from scientific fact about how your body works. We practiced the massage techniques and relaxation cd in the couple of months upto labor and it did change my perspective on the upcoming event! I felt much more relaxed and knowledgable about the process and by the time my surges started (9 days overdue) I was keen to meet my little munchkin! During the course I had an idea of what I thought (and hoped) my labor would be like and planned the lot- being my first baby I expected a fairly long labor so downloaded comedies on the sky planner to release endorphins during the beginning stages, packed my fairy lights and lavender spray to see me through in the hospital etc. I had argued throughout my pregnancy to be midwife led as just loved the idea of a water birth in the new midwife led unit in hull….. well my experience actually was completely the opposite! Being 9 days overdue I was keen for things to start moving as didn’t want to go down the route of induction so after a nice long walk and visiting some babies the day before (not sure that helped but you never know!) my water eventually broke (well a tiny trickle) at 2.30am after getting up out of bed- towards the end you never do get a full nights sleep with that belly. I did feel I had a bit of stomach ache and only felt some slight surges but nothing to write home about so just decided to give the hospital a ring just to warn them I may be coming in at some point. They asked if baby was engaged which per my last midwife appointment she wasn’t so they asked me to come in for an examination. By the time we got the bags sorted and got on our way the surges were coming a little more but not as regular or clockwork like as i expected. I had a relaxing car journey there as we played the hypnobirthing cd in the car and I practiced the breathing techniques and I did feel mentally ready for our journey to begin! Having arrived at the hospital they seemed to have increased and I was 4cm when I was examined. Remaining quiet and relaxed, breathing through the surges I felt in control and just took each one as they came. Due to increased protein they said I had preaclampsia and therefore said I needed to be in the labor ward, no water birth and to be continually monitored by the straps around my tummy….great, everything we argued against during my pregnancy! However that didn’t seem to matter at that moment, my head was focused on applying the techniques I’d learnt with each surge and I knew I would meet my baby soon so followed the advice of the midwifes to get her here safely. I was admitted into the labor ward and once examined again I had quickly progressed to 8cm. Hypnobirthing taught me techniques which when I put into practice my head was that focused on dealing with each surge I managed to block out screams from other labouring mothers as well as any concept of time. Hubby was there all along and held my hand and gave me the space and quiet he knew I wanted during that time. One thing I did seem to do was lay on my side when my surges started nearing the end (which I knew was not an easy way to give birth) yet because I was so focused and in ‘my zone’ it didn’t occur to me to change positions to make the birth easier. My midwife luckily suggested I kneel over the back of the bed which I did per her instruction- sometimes I think I just needed telling what to do nearer the end as my head was not thinking. Surges were intense but manageable and with some gas and air 10 minutes later (apparently) my 7lb 15oz baby Florence came into the world, arriving at 9.26am. Holding your baby for the first time is unexplainable and it’s true that all the labour becomes a blur as soon as that little baby arrives! Unfortunately I had some complications after the birth when delivering the placenta I lost a lot of blood and passed out as well as having a postpartum hemorrhage so needed a lot of immediate attention and fluids which knocked me out for a good 5 hours. What I would say though is those breathing techniques and relaxed state of mind were again put into practice during this time. 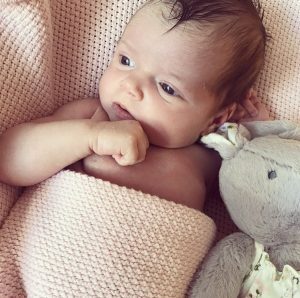 The midwifes, my husband and my mum were fantastic during that time making sure Florence was given lots of cuddles and the midwife spoon fed her formula as I was too weak to breastfeed and she didn’t want to interfere with a teat. Despite not getting the birth I hoped for (my fairly lights and lavender didn’t even make it out the bag!) what I can say is the knowledge I learnt from hypnobirthing put me in such a prepared mental state and the techniques I learnt and practiced helped my get into a zone where I could breathe through each surge that brought my baby into my arms.